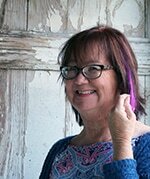 I have to tell you about my painted storm door. I painted it over three years ago and the paint isn’t chipping or peeling. How awesome is that! You’ll have to forgive the lack of décor and the cobwebs and the oh so lonesome wreath hanger. I haven’t gotten around to decorating for Summer yet. You guys keep asking about the door and I keep forgetting to take photos! One day last week I remembered…..finally….and just grabbed the camera and started shooting. No clean up, no nothing. The door is in great shape. Looks just like it did after I painted it in November of 2012. Seriously. The sun shines straight on this door and the door gets hot. Doesn’t affect the paint at all. 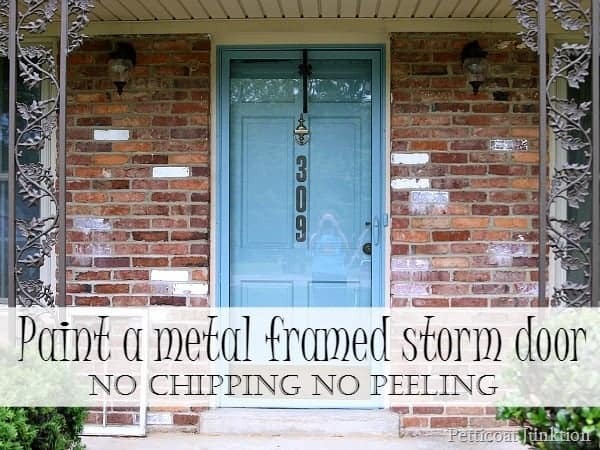 The original post and tutorial is here…How to Paint your Front Door and Metal Framed Storm Door. I show the complete paint job from beginning to end for both doors. The paint is Behr and the primer is Glidden Gripper. The color and editing on these photos are better than the ones from 2012 thanks to my new camera and a photography class….and lots of practice. I have to admit to having doubts as I was painting the door. But it looks great. 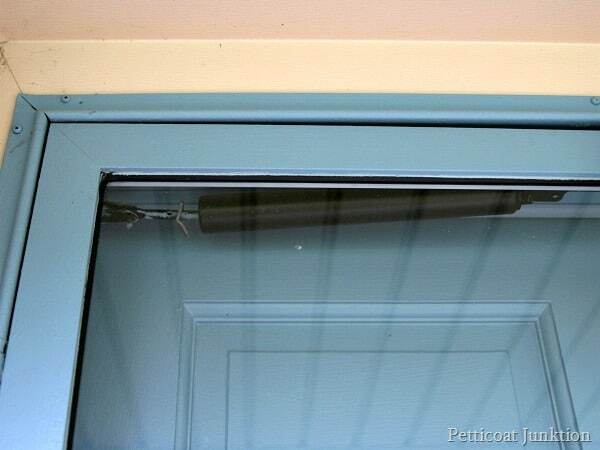 The storm door trim around the glass was white and it really stood out. I didn’t figure I had much to lose. Please ignore the cobwebs….I did warn you. 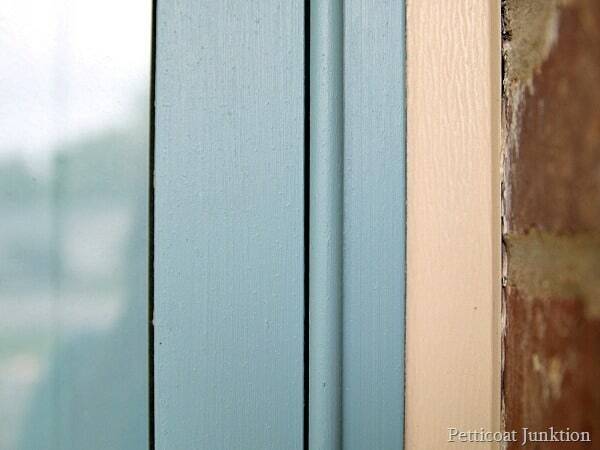 I took photos of the door in various areas so you could see how well the paint has held up. I can’t tell that the paint has faded at all. And that’s it. Thanks for asking about the door. I’m going to paint our back door and storm door soon. I may get you guys to help me select a color. That should be fun! Thanks for sharing this update, I just got done reading your original post from when you painted it the first time in 2012. 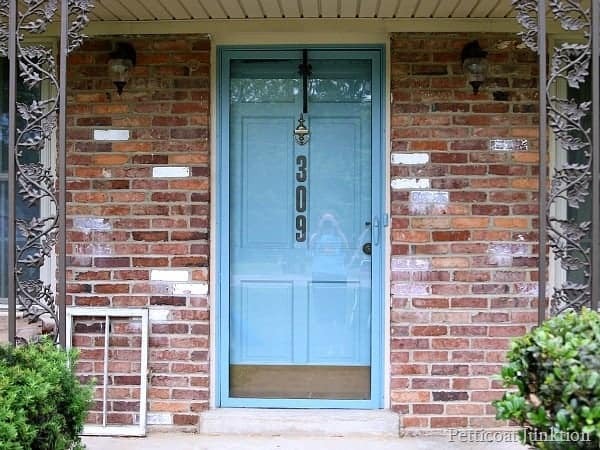 I am planning to do this to our front door in a dark teal this fall – right now the door and storm door are a dark brown. I like that the storm door frame basically disappears into the door and does not stand out at all. Looks great, thanks again for sharing both the tutorial and the update. I will go back and read which paint you used on the doors – obviously it holds up well to the elements. Thanks for the comment Amy. I used Behr paint and Glidden primer for the door. Thanks for posting the follow-up. 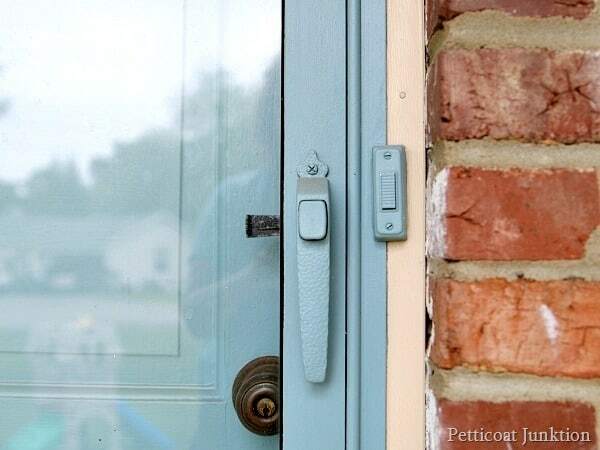 My beautiful turquoise front door color is obscured by my cream-colored storm door – and now I have the courage to paint it as well! I was concerned that paint would not hold up over time and use. What was the name of the primer you used? Thank you. 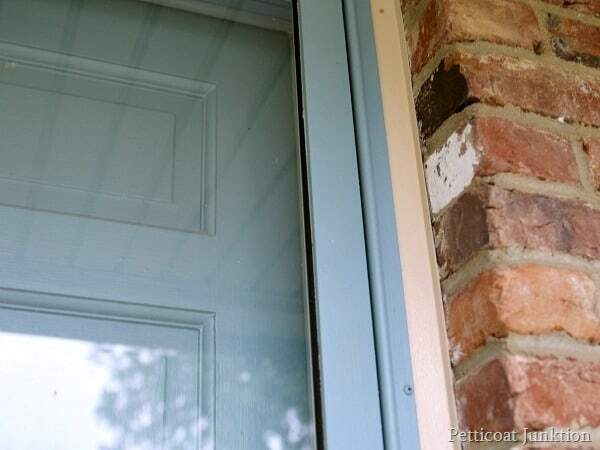 Going to paint my ugly white storm door red to match my front door. Thanks for your tips. 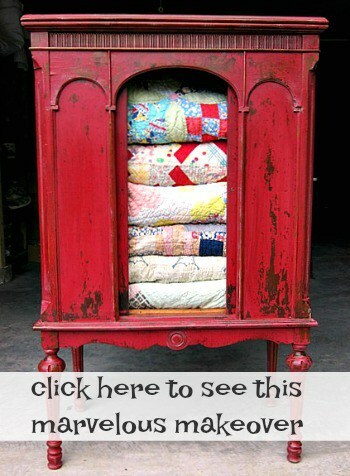 Did you use a paint brush or small roller? I especially like the metal leaf decor framing it! Get up and do it! After you are fully recuperated of course.